And the Emmy for Best Commute goes to #bike2emmys 2015! On Sunday night, viewers from around the world tuned in to the 67th annual Emmys Awards. Similar to the Academy Awards for film and the Grammys for music, the Emmys recognize outstanding work in American primetime television programming. The Emmys are quintessential Hollywood, with actors and actresses, editors and producers, parading in the splendor and soaking up the limelight as millions watch. Those familiar with the golden awards associate them with glitz, glamour, red carpets, fashion police, and limos. Lots of limos! For Mad Men writer-producer and Emmy nominee Tom Smuts, however, limos are passé. Since last year, Tom has opted for a more efficient and liberating vehicle to get to the awards ceremony, his bicycle. This year, he led a 20-mile bike ride from his home in Santa Monica to the Microsoft Theater at L.A. Live in Downtown Los Angeles for his second annual #bike2Emmys ride, demonstrating that it is possible to bike anywhere in Los Angeles. Not only did Smuts and his posse bike on one of the hottest days of the year (that nearly caused one Emmy attendee to faint), they rode in their Sunday’s finest in true Mad Men style. 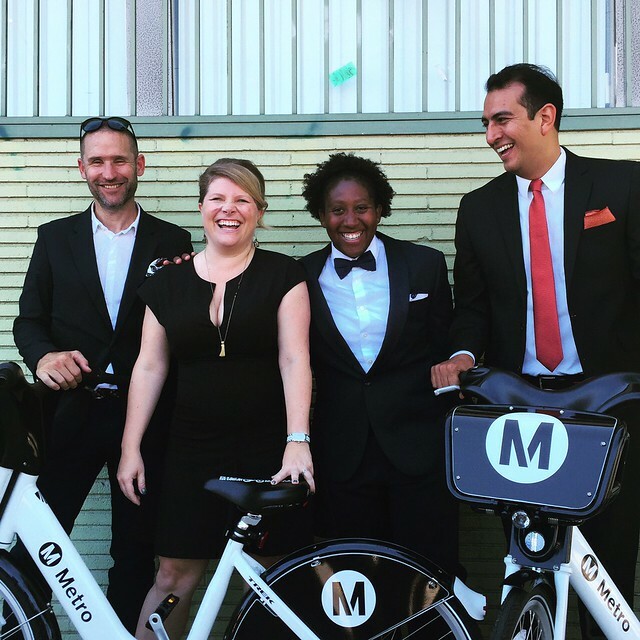 Riding to the Emmys in style with #bikeshareLA superstars. Bike Program Stickers and Spoke Cards Coming to an Outreach Event Near You! 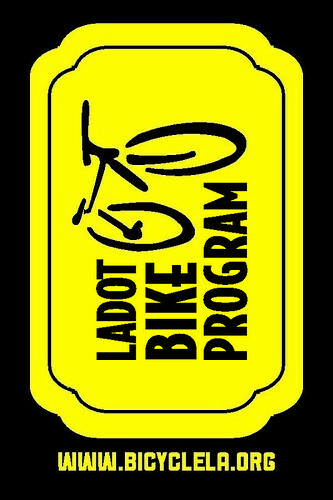 2014 is a big year for the LADOT Bike Program identity! 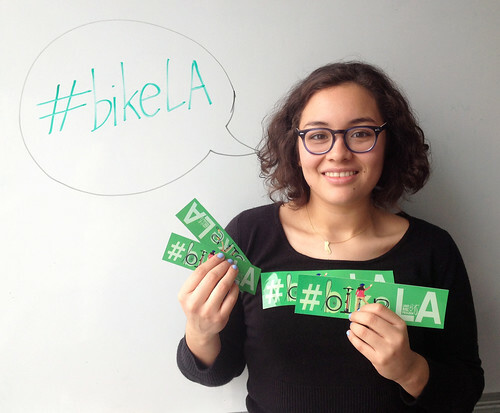 For the past 8 months we’ve been blessed with the ultra talented Karina Macias, our pro-bono consultant who designed new Bike Program stickers, spoke cards, and took the Bike Program graphic identity in an entirely new direction. The Bike Blog took a moment to sit down with this graphics mastermind to get to the bottom of her brilliant design strategy. This is your Golden Ticket! 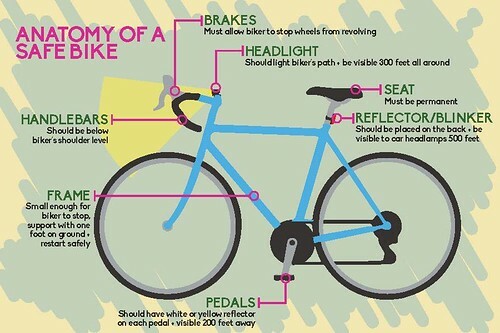 Bike Blog: And the anatomy of a safe bike? 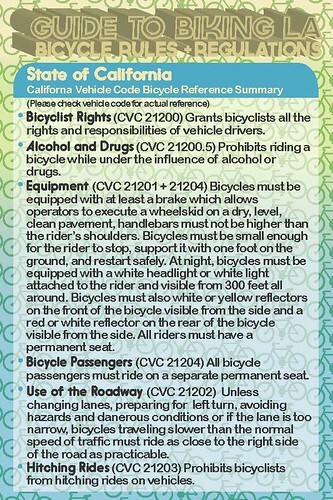 Karina also designed a very handy spoke card that outlines the rules and regulations every Los Angeles bicyclist should know and carry on their bike. 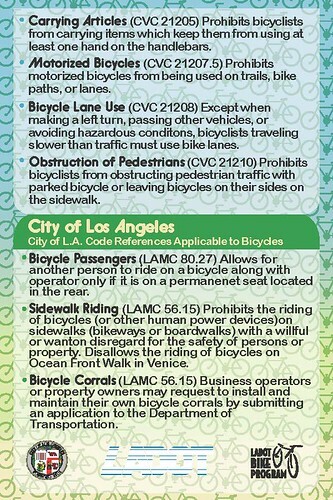 The card includes both State and LA City bicycle laws. We are so proud of these new promotional materials! Please stop by an outreach event soon to stock up on our fun, informational, and awesomely designed stickers and spoke cards! Jump on the train! The bike train that is… A group of enthusiastic bicyclists have organized LA Bike Trains: routes across Los Angeles, encouraging Angelenos to ditch their cars and join a bike train to work. What is a bike train? It’s a slow and steady bike ride to work taking a regular route in the company of other bicyclists. Bike trains are led by reliable Conductors that monitor the speed and safety of the ride, ensuring all commuters are on board and comfortable. Bike trains encourage safety in numbers and provide a festive morning commute. Bike Train Conductors are dedicated volunteers, experienced urban cyclists who recognize that biking to work can be daunting for an individual, but easy and enjoyable in a group. Led by Bruce Chan – Meets Wednesdays at 8:00am at Cafe Tropical. Led by Nona Varnado – Meets Wednesdays 9 am at Cafe Americano . Led by Wes High – Meets Tuesday at 7:45am at Sunset Triangle Plaza. Led by Alex Rixey – Meets Thursdays at 8:00am at Caffe Vita on Sunset and Hillhurst, near the Vista Theater. Led by Christopher Lovejoy – Meets Wednesdays 6:45am at 7-Eleven on 7th Street. LA Bike Trains is eager to expand! To provide input where you would like to join a bike train, fill out their Commuter Survey. 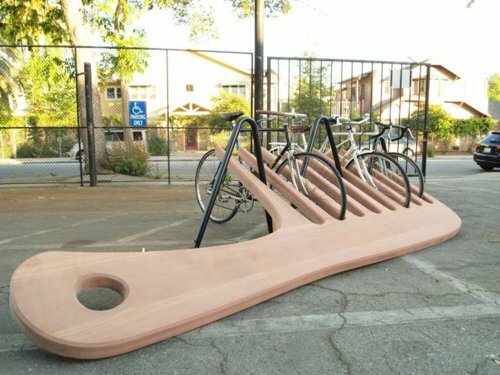 Tomorrow afternoon, the Planning & Land Use Management Committee will review an ordinance that aims to vastly improve bicycle parking requirements in the city. 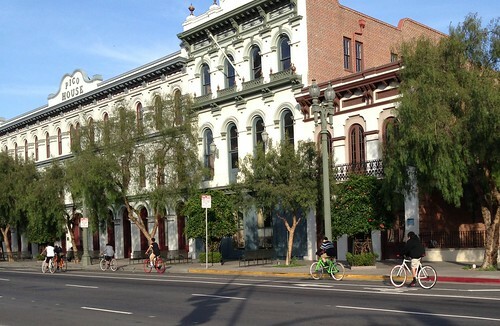 If adopted, the Bicycle Parking Ordinance would increase the amount of bicycle parking required in new commercial, industrial developments while for the first time requiring bicycle parking in new multifamily residential developments, as well. The ordinance proposes set standards for signage, lighting, and access; and, addresses different types of bike parking, including the need for both short and long-term parking. The proposed ordinance was reviewed and passed by the Transportation Committee last week. Please consider attending the meeting tomorrow to show your support for improved bicycle parking requirements in Los Angeles. The meeting is set to be held at the Board of Public Works Edward R. Roybal Hearing Room 350, City Hall, 200 North Spring St., at 2:30 pm. This is the second installment of “Thinking Outside The Box,” a new series on non-standard bikeway treatments! This particular post will discuss various alternatives to deal with two infrastructural necessities which are often at odds with one another: bikeways and parked cars. Since parked cars and bicycles share the shoulders of city streets, these design solutions seek to mitigate concerns so the two can coexist. These treatments are ideal for moderately trafficked two-lane streets, and offer innovative ways to accommodate both cars and bikes. Continue reading after the jump. In this new series, “Thinking Outside the Box” we will review non-standard design treatments, offering readers an informed take on various bicycle infrastructure features. The inaugural post covers separated bicycle lanes, alternatively known as cycle tracks, which are fairly common in Europe and I’ve had personal experience with them during my time in Copenhagen. 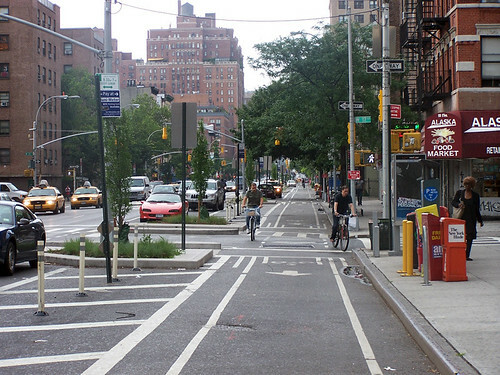 Often these lanes feature a physical barrier between automobiles and bicyclists, simulating a separated bikeway. Perceived safety undoubtedly increases with the presence of physical barriers, which is instrumental in getting less experienced bicyclists to bike. While separated bicycle lanes have benefits over striping, they also have much higher financial and political costs which can be difficult to overcome without extensive community outreach. They often require the removal of either a vehicle travel lane or parking and have longer installation times. This isn’t to say implementation is impossible; the City of Long Beach and New York City both have pilot projects in place. If there are any other examples that you think deserve mentioning, leave a comment!